Located just three miles from downtown Orlando, Baldwin Park is one of Orlando's newest and most desirable residential neighborhoods. 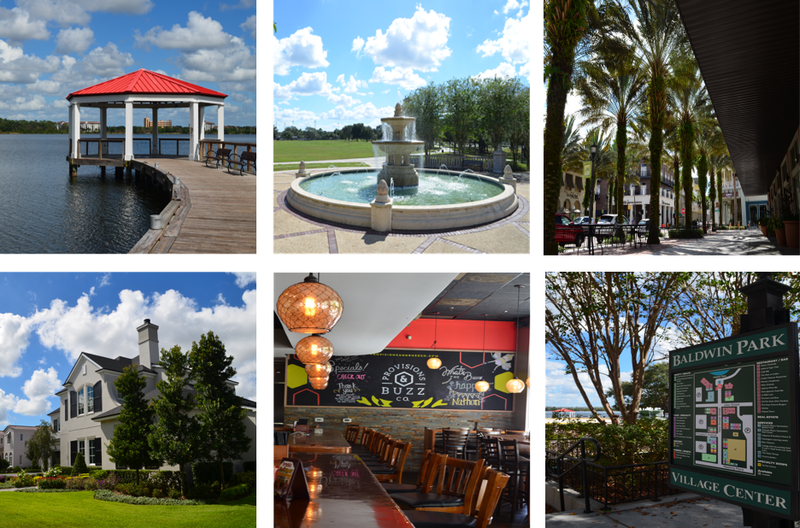 With a span of just 1,100 acres, Baldwin Park maintains its small-town community feel despite its wealth of beautiful houses, apartments and townhomes, top-rated schools, picturesque parks and lakes, and shopping and dining options. Apartments in Baldwin Park are ideal for families and young professionals who enjoy a small, quaint community with an exceptional location near Orlando's business district and other top attractions like Universal Studios, the Amway Center, SeaWorld, and the Orlando Science Center. Delicious food is at your fingertips when you live in apartments in Baldwin Park with options ranging from authentic Mexican cuisine to freshly prepared sushi. Nearby you'll find a mix of unique local eateries like Manny's Original Chophouse (steakhouse), Meza (Mediterranean grill), Farris and Foster's Famous Chocolate Factory, Colibri Mexican Cuisine, Seito Sushi, and Osprey Tavern (American). Grab your coupons, throw on a pair of comfortable shoes, and get out of your apartment for a day of fun at some of Orlando's best shopping destinations. Down the road from your Baldwin Park apartment you'll find major apartment stores like Dillard's Macy's, Target, and Sears, as well as a variety of unique, local shops at the Baldwin Park Village Center in downtown Baldwin Park. At the Village Center you'll find everything from shopping and dining to nail salons and fitness centers. If you're a serious shopper looking for even more action, head over to Millenia where the options are limitless. You can't miss the Mall at Millenia, an upscale shopping mall with over 150 shops including Chanel, Apple, Louis Vuitton, and Tiffany's. If you're a deal hunter check out the Orlando Premium Outlets for high-end brands at a discount. If entertainment and a happening nightlife scene is what you're after, then an apartment in Baldwin Park is perfect for you! Catch up with friends and enjoy a good beer after work at Tactical Brewing Co. or head to The Nest in downtown Baldwin Park for a yummy cocktail or class of wine and some hors d'oeuvres. Every Friday night you can catch live music, free food samples, local art, and drink specials at the Village Center for First Friday. You can take in a show or cheer on the Orlando Magic at the Amway Center or visit the Orlando Science Center for a day of learning. A short drive away you'll also find major tourist destinations like International Drive, Universal Studios, SeaWorld, and Walt Disney World. Close to your Baldwin Park apartment, you can enjoy a day of fun in the sun at Lake Baldwin Park, complete with a sandy beach, two pavilions, a boat ramp, and picnic tables. This is a great place for the whole family, even Fido – Lake Baldwin is dog-friendly. The kiddos can laugh and play on the Park's brand-new playground area as well. Previously home to the Orlando Naval Training Center and thousands of military personnel known as "Blue Jackets", Blue Jacket Park is also a wonderful place for families seeking an enjoyable day outdoors. This 75-acre public park hosts a variety of fundraising walks, 5k's, wedding ceremonies, and birthday parties. Be sure to bring your sports equipment – this is a great place for a good game of soccer, baseball, or frisbee! When it comes to education, apartments in Baldwin Park have you covered with top-rated schools for all ages. Children in grades K-5 are zoned for Audobon Park Elementary, while those in grade 6-8 are zoned for Glenridge Middle School. For students in grades 9-12, Winter Park High School and College Park's Bishop Moore Catholic High School are both located just a few miles away. Baldwin Park is also home to the following specialized schools: Trinity Preparatory, Lake Highland Preparatory, The Geneva School, and St. Margaret Mary Catholic School. College students also have a wide-variety of A+ options all within 10 miles of Baldwin Park, including Rollins College, Full Sail University, the University of Central Florida, and Valencia College's East Campus. Baldwin Park is ideal for business professionals as residences are close to the business district of downtown Orlando. Major employers near the Baldwin Park area include the Orlando Regional Medical Center, Universal Studios, Adventist Health, SeaWorld, Lockheed Martin, and Walt Disney World. This area of town is also home to several mid-range and smaller boutique firms and offices that cater to numerous different occupations. Many apartment communities in Baldwin Park also offer major employer discounts – an extra perk for working close to home! Right on the outskirts of downtown Orlando, Baldwin Park is still subject to a bit of congestion during peak travel times. Because Baldwin Park is primarily residential, speed limits tend to be on the lower side to accommodate pedestrians, young children, local shops downtown, and school zoning. This can cause traffic to move slower in certain parts of town, so allot a little extra time if you're traveling on a deadline. If you travel for work or school, you're in luck! Getting to other parts of Orlando is a breeze with major roadways like the East-West Expressway (SR 408), Interstate 4, and Greenway SR 417 nearby.